it sounds like a developer is interested in both os4 and mos and his project doesnt need much work to port.. nothing wrong with that. Both MorphOS and Hyperions OS are based on Amiga OS API, everybody knows that! Obviously ABox is based on OS3,1? you must be very blind. On mr.Carrolls' defence, I don't see it as "stealing" either. Could be co-incidence. Remember, both products are pretty similar, with pretty similar goals. >Obviously ABox is based on OS3,1? >you must be very blind. In this case I am talking about Paula-redirection. 3 days ago MOS reported to have audio.device-emulation. Now that's a major coincidence for me. You said "Why everytime MOS announces a feature OS4 is going to announce is 2 days later, too?" .. What other features have they copied besides the paula emulation? Your post kindof implied they've done this a bit in the past. Now you know you don't need to take me word by word. Now we have *at least* 2. The point is, they're doing it. What's your problem dude? Are you gealous or what? I thought the same when I saw that MOS boot selector is almost dentical to the AOS one. But I think it's just good development from users perspective ! "Now if you don't see it, you must be very blind." Take a deep breath and think again. Copying MorphOS? I don't think so. NallePuh OS4 has been in beta testing for weeks. booted on the AmigaOne mid last year. AOS 3.x source (you don't oppose here, do you? ;-)), OS4 does. When did MorphOS introduce gradients? Maybe my memory is getting fuzzy, but I seem to remember this being something MOS added (very) soon after it was first seen on OS4. I remember noting that because they both implemented it so close to each other. Then Aros implemented them too, sometime later. This looks like the first time we saw gradients in OS4. Anybody have a date for this? Not that it really matters which came first. You get gradients on other platforms for years. So who copied who/what? I'd suggest the important thing is how well it is implemented. Features of the features. Sorry, but I heard about OS4 Paula support long time ago, not just few days ago. So who's copying who ? Only that this is already a few weeks old. The item appeared on the beta list on August 15th. Sorry to disappoint you. Only that this emulation already exists since quite some time on OS4. Ask one of the beta testers, if you don't believe me. > stealing features from MOS. It isn't. It's a port of NallePuh, completed on August 15th. The wish to emulate audio.device is so obvious for backwards compatibility that I find allegations of "stealing features" rather stupid. But hey, he's an anonymous. What do I expect. "When did MorphOS introduce gradients? Maybe my memory is getting fuzzy, but I seem to remember this being something MOS added (very) soon after it was first seen on OS4." I think AROS implemented/announced gradients first. AROS implements animated PNG icons. Let's hope others are following. It seems we're doing a good job if the only thing you can troll about is spelling errors. It was talked about in AW.net some time ago, and sure not just 2 days ago. I don't remeber if it was about nalle puh or something else, but it's few weeks when it was talked about. > The gradients were officially released in MorphOS 1.4 .. I can't find a direct date reference for that early OS4 screenshot. There is a post on amiga.org that mentions it by filename, but I can't access the actual message. (Did a search on amiga.org.) The date of that post is also May 2003. A quote from this new item being: "None of the new screenshots show the default AmigaOS 4.0 appearance, although some of them contain certain elements or concepts that will become part of it." > I think AROS implemented/announced gradients first. Nope. MOS was first, then I thought "what the heck, let's have some fun", and 2 hours later gradients were implemented in Zune as well. What's the fuss about anyway, features are features, you can't "steal" them. "What's the fuss about anyway, features are features, you can't "steal" them." "LOL. Especially since MOS copies the AmigaOS API..."
And so does Hyperions OS! Humm... 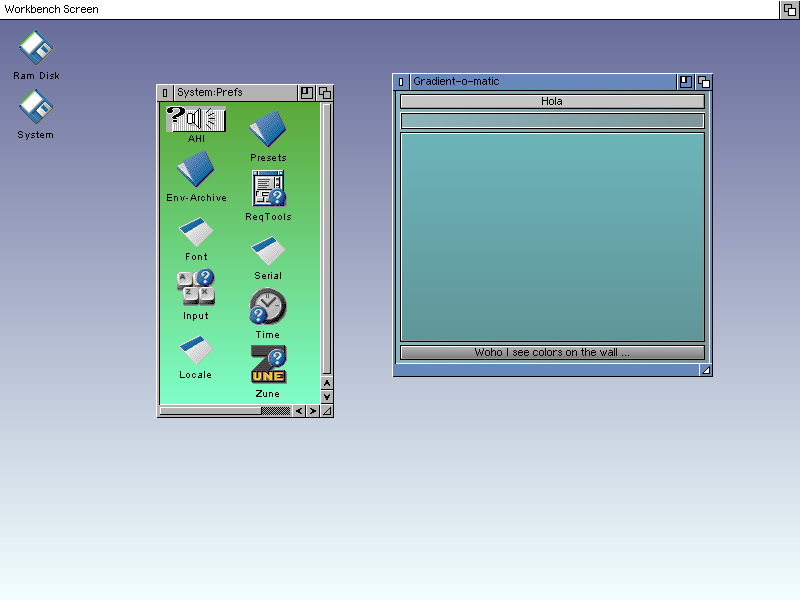 I still remember Friedens announced gradients after MorphOS and AROS, but maybe they meant Reaction GUI. Maybe gradients were in the VisualPrefs in 2002 already (no idea, I never looked into those colour horror pics from 2002). But then, it doesnt matter who did what first. It is vapour until it is released. > they meant Reaction GUI. I have a mail here with the first GUI designs by Matthew Kille dated somewhere in October, 2002. It pretty much already looked like the current design, only with the darker backgrounds, and it had the gradients already. I don't remember when it was first announced though. And who cares which OS had which feature first ? Atleast not those who actually use those systems.